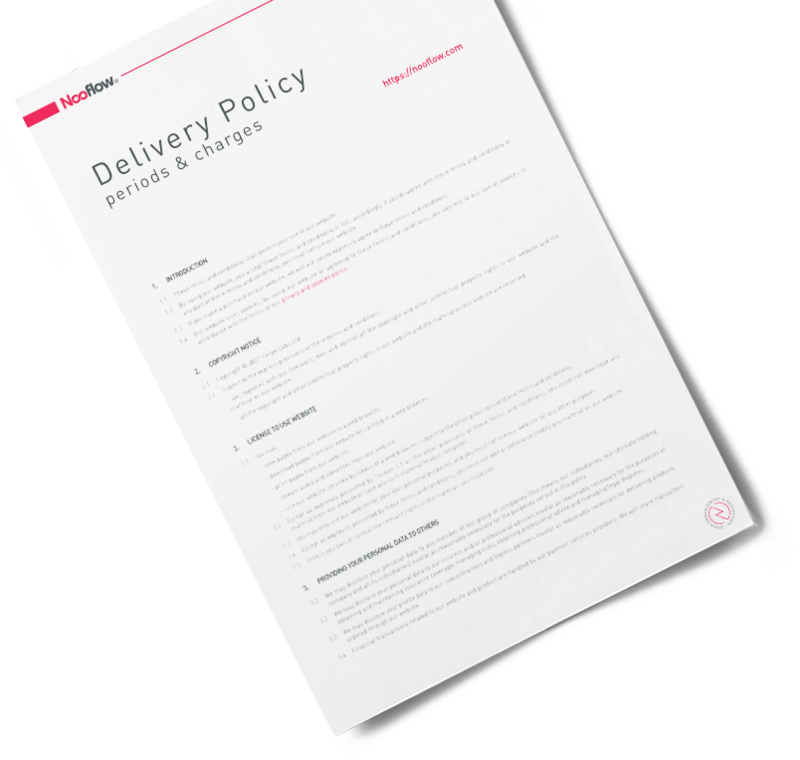 Within this policy, we set out details of the delivery methods, periods and charges. 1.1In this policy we set out details of the delivery methods, periods and charges that apply to orders for our products made through our website. 1.2This policy shall not create legally enforceable rights and obligations; rather, our usual practice in relation to the delivery of products is indicated in this policy. 2.1We offer free, worldwide "Standard" delivery on all orders made through our website. 2.2Additional shipping costs may apply if “Priority” (expedited) shipping option is selected. 3.1We will usually be able to deliver to the countries and territories available in the list on our checkout section. 4.1The methods that we use to deliver our products, and the time periods within which delivery is usually completed are shown during checkout, on the “Shipping Method” section. 4.2If you place your order by 4pm GMT/BST on a working day, these time periods run from the close of business on that day; if you place your order after 4pm GMT/BST on a working day, or on a non-working day, these time periods run from the close of business on the next following working day. 4.3The delivery periods set out in the “Shipping Method” section are indicative only, and whilst we will make every effort to ensure that you receive your delivery in good time, we do not guarantee delivery before the end of the stated period. 4.4We may conduct fraud screening checks before dispatching the product, and these checks may delay your delivery. If the delivery is likely to be delayed as a result of fraud screening checks, we will notify you. 5.1Delivery tracking is available in respect of all orders for our products. 5.2Upon dispatch of your order, an e-mail with all delivery tracking information will be sent to you. 6.1All deliveries must be received in person at the delivery address, and a signature must be provided. 6.2Our delivery service provider will notify you in advance of attempting to make a delivery requiring signature. 7.1If an initial delivery attempt is unsuccessful, our delivery service provider will make at least 1 more attempt to deliver the products in your order. 8.1If your products remain undelivered despite our delivery service provider making at least 1 more attempt to deliver them, the delivery service provider will leave a card at your address, with instructions on how you may collect your products, including a time limit for collection. 9.1If you experience any problems with a delivery, please contact us using the contact details that we publish on our website. 9.2If our delivery service provider is unable to deliver your products, and such failure is your fault, and you do not collect your products from our delivery service provider within the relevant time limit, we may agree to arrange for re-delivery of the products; however, we reserve the right to charge you for the actual costs of re-delivery (even where the initial delivery was free of charge). - if in-person receipt is required, there is no person available at the address for delivery to accept delivery and provide a signature.